White hand towels in economy grade, for any business looking for cheap hand towels in medium size, made of 100% cotton.Super white Economy towels. Whether you're a business owner or a homeowner, you need hand towels. 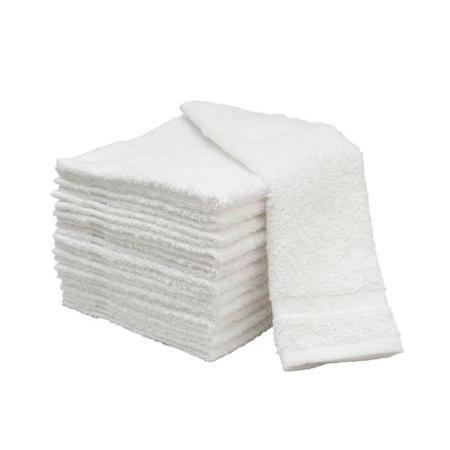 Why not pamper your guests, patrons or family members by ordering a supply of wholesale hand towels from Towel Super Center? We make it simple for anyone to get deep discounts on superior economy grade white hand towels. You'll love how soft they are and how long they last. As the owner of a nail and/or tanning salon, you know how important it is to have hand towels ready throughout the day. To ensure you have a continuous stock of high-quality options that will wow your clientele, buy only economy white hand towels from Towel Super Center. These economy hand towels are made from 100% cotton fibers, giving them the benefits of cotton at a reasonable price. We offer units of 12 hand towels, allowing you to buy as many as you need. Remember that because you’re getting all of your hand towels from one source, they’ll be the same foldable, stackable 15” x 25” size. Order your hand towels and other nail and tanning salon towels today from our online store. Does it seem like your hotel, spa or gym is always running low on hand towels? Stop buying replacement white hand towels and paying too much. Order a supply of wholesale hand towels in bulk and never worry that you'll be without them when you need them most. Our incredible pricing makes it possible for you to get more towels for less money than you imagined. Finally, you can be frugal without your customers knowing! Are you looking for a way to offer patrons the opportunity to "go green" or be more environmentally friendly when washing their hands in the restroom? Instead of installing a blow dryer that uses energy or offering landfill-clogging paper towels, provide a basket of neatly stacked economy white hand towels. It will be your way of showing that you not only care about the environment but also that you value the comfort of your customers, too. In today's competitive marketplace, you might be surprised at how much of an impact such a simple eco-friendly move can make. Avoid constantly buying hand towels. Save money and purchase 100% cotton economy hand towels that are built to last. Each hand towel is made from strong cotton fibers that resist stretching, tearing and losing shape. You’ll notice right away how they hold up each time you use them. Plus, they seem to get softer and more comfortable the longer they’re part of your team! Have you found that some of your hand towels hold onto stains? Not these! Cotton is a stain-resistant material, and thanks to its white hue, it can be cleaned with a bleach product or bleach alternative. Additionally, cotton is fast drying, allowing you to use less energy every time you launder your supply of hand towels. Trust Towel Super Center for the most reliable economy white hand towels on the market!